The War Memorial Hospital, Scunthorpe, where firewatchers were based. During the Second World War, firewatching was a system designed to keep watch for falling bombs during air raids and to extinguish them. Scunthorpe suffered little bombing, so the firewatchers at the local hospital looked for a more fruitful way of passing the time. They decided to read some plays, and The Hospital Players were born. Another objective was to raise money for the Hospital which, before the introduction of the NHS, depended on voluntary contributions for its upkeep. The Hospital Players’ first play, J.M. Barrie’s ‘The Admirable Crichton,’ was performed on Saturday 19th June 1943. This and other early plays were presented at the Savoy Theatre for one performance only. The Savoy was located on Cole Street, where F. Hinds Jewellers now stands. During the War, performances were also given at nearby Army Camps and Air Force Stations. 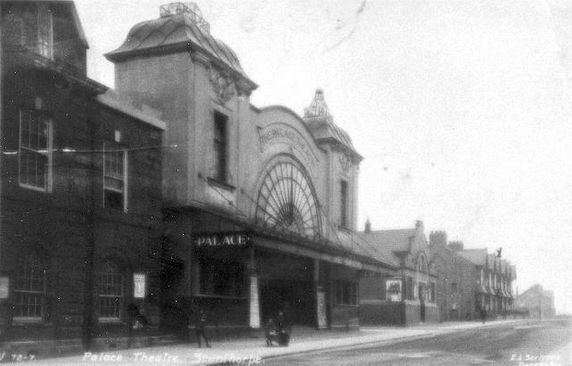 The Savoy Theatre, formerly called The Palace. For some time a minimum of the proceeds was taken for expenses, royalties and taxes, so that as much as possible could be given to the Hospital. For example, we presented £500 to provide a cot for the children’s ward. Following the introduction of the NHS, our proceeds went to the Hospital League of Friends. We make donations to the League of Friends to this day.